I made a great discovery this month! I found out that the cool farm vibe that I thought came from being out on a farm can be had anywhere. You can have it right now, right where you are. For the price of a book! The answer is in the bestseller The Life Changing Magic of Tidying Up by Marie Kondo. People hang onto stuff for many different reasons. The only reason for keeping something is if it brings you a spark of joy. Get rid of all of the things that don’t bring you a spark of joy. Then you will be surrounded only by stuff that brings you a spark of joy! And your life will be transformed. You will have your beautiful dream life. It seemed like a stretch at first. Until I reached the part about books. Books are precious to me. I love buying and reading books. My books at home are organized in the Dewey Decimal system. My books have coded stickers on their spines to keep them in proper order. How could I tear my system apart and get rid of my books? That’s when it all clicked for me. That cool farm vibe I had at the farm was not really from some magical breeze wafting in peace and quiet. Because sometimes the breeze smelled like pig and carried in the neighbor’s karaoke. It was because everything in the farm was there because it brought us a spark of joy. From the ceramic owl pedestal holding up the bath things to the plates we used for dinner. I was very careful about what I let into the farm and because of that, going to the farm always felt like a special treat. What a great discovery! I could have that cool farm vibe in my everyday life, not just when I’m at the farm. Without buying anything. All I had to do is to get rid of stuff until all that’s left are things that bring me a spark of joy! It has a lot of detail on how to get rid of the stuff. Like, start with your clothes, then books. Very personal things last. You don’t feel bad about getting rid of stuff because she teaches you how to let go and say goodbye and thank you to your things for doing their job. It’s a short, easy to read book! She says an entire house typically takes 6 months to finish. I just got it on Kindle. Now we’ll see how fast I can reduce my years of stuff, some going back a couple of generations! Thanks for bringing this book to my attention. I’ve read hit-or-miss about the idea online, found it intriguing, but then life happens and off my attention drifts. An actual book is less forgettable. I wish you well in your decluttering! 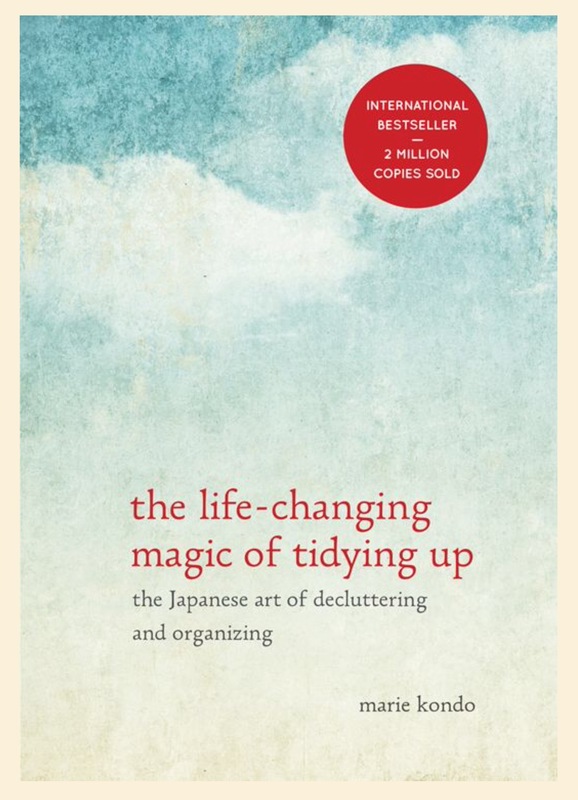 What I like about this book compared to other methods is that you’re not decluttering just for the sake of being super neat or organized or simple or trying to have only “x” number of items in your house. Those methods are sometimes so arbitrary and artificial and they feel negative, like I need to sacrifice or give up certain things to achieve simplicity. This method of Marie Kondo is very positive. Also, you only do it once! Her clients don’t backslide! Hi Sylvia! I bought this book and will read it this month. Thanks for this timely recommendation. I hope it doesn’t take me years to complete this project. Hi Arlene! It’s a great book! Just do it. I think she tells you to start with clothes because it’s the easiest to figure out whether or not it gives you a spark of joy. It’s a little hard at first and it might take you a long time to go through all your clothes. But after a while, you get better and faster at figuring it out and the rest of your tidying up will go much faster and easier! Good luck! It is very akin to feng shui – decluttering, to let the right energies flow and infuse your world inside and out. That’s a great description! I read the book for the decluttering tips and discovered that there is more to it than just getting rid of stuff and making your space tidy. I guess that’s why she calls it “life-changing magic”. It did change my life, and I already considered myself tidy and a big de-clutterer! Next Next post: If You Build It ..